Any work on Dark Horse being at SDCC (san diego comic con)? Because that would be the best time to announce a new series for Tomb Raider and the Lara Croft series. Assuming we get comics when the next game releases, I really really really hope Philip Sevy returns. Oh definitely. And at least on Instagram the does seem to very much enjoy drawing Lara, and always said he had a great time drawing the comics. Beside, his work on Inferno, especially issues 2 and 3 was top notch. When (not "if", when) the comics return, I really want him to return. He has become to the reboot comics what Andy Park was for the Top Cow comics imo. Hell, I'd bring the whole creative team from Inferno back, really. Also loved the writing from Jackson Lanzing and Collin Kelly. They made the terrible art from Survivor's Crusade bearable. 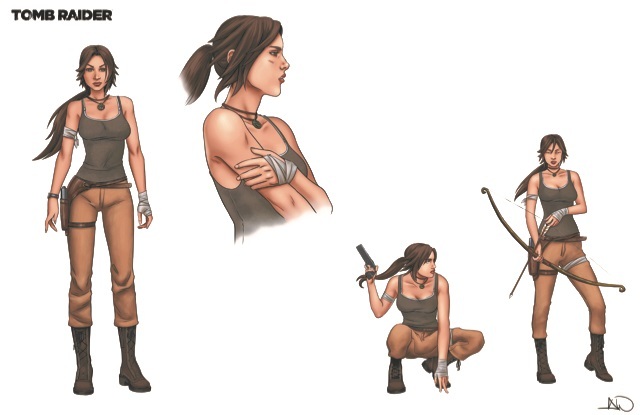 Speaking of which, I came across these sketches from Ashley A Woods for Lara in "Survivor's Crusade", and while I still prefer Tomb Raider comics to have a more realistic art, this is so much better than what we actually got! Seriously, what the hell happened here? I'm starting to feel, with these sketches and her online portfolio, that Woods is perhaps a better cover artist. She probably can't handle a full comic's schedule. Woods is actually a VERY talented artist if you look at her work on her Twitter page. Her artwork on Niobe: She is Life was nothing short of gorgeous. A few pages in Survivor's Crusade also looked REALLY good. I get the feeling that with Survivor's Crusade, Ashley really phoned it in. It's like she only drew rough drafts without polishing them. I know. Especially by her portfolio, you can see she as a thing for drawing attractive powerful women. In paper she would be perfect for Tomb Raider. But see also the release dates for each of the Niobe issues. Issues 1 and 2 are really far apart, and issues 3 and for are a whole year apart. The only issues that have a "normal" release schedule are issues 2 and 3, which I suspect that they were either the same issue that got too long and were divided in two, or were worked at the same time. This is why I think she might be a better cover artist, or maybe for graphic novels: her work is gorgeous but only when she doesn't have to do too much in a short time. She definitely is not suited for full, monthly issues, and her work on Tomb Raider shows that.